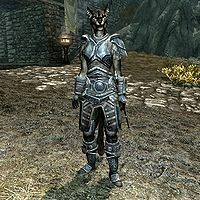 Khayla is a Khajiit warrior who follows Ri'saad's trade caravan. She's the common-level trainer in Sneak. Khayla wears a full set of steel armor, excluding the helmet but including a pair of steel gauntlets (two variants), and a pair of steel boots (two variants). She is equipped with a steel sword and a steel shield, and carries a selection of common loot and gold. When asked for training, she will reply, "They'll never see you coming." This page was last modified on 21 March 2014, at 18:25.